At SAHA, "green building" is in both the small details -- using recycled materials and native plants -- and the big picture -- making sustainable, beautiful and healthy places to raise families and create community. From site planning to finish materials, we use design strategies, building systems, materials and methods that ensure our buildings contribute to the sustainability of the neighborhood and natural environment in which they are built. The U.S. Green Building Council (USGBC) is a 501(c)(3) non profit composed of leaders from every sector of the building industry working to promote buildings and communities that are environmentally responsible, profitable and healthy places to live and work. The mission of the USGBC is to transform the way buildings and communities are designed, built and operated, enabling an environmentally and socially responsible, healthy, and prosperous environment that improves the quality of life. Developed by the USGBC in 2000, the LEED rating systems are developed through an open, consensus-based process led by LEED committees. The latest update of the LEED rating system, coined LEED v4, is the next step in the continuous improvement process and on-going development cycle of LEED. To learn more about LEED, visit the USGBC website. Built by a partnership between the Oakland Housing Authority and Satellite Affordable Housing Associates, Lakeside Senior Apartments provides 92 permanently affordable apartments for seniors whose income is at or below 50% of the area median income, including 32 homes set aside for formerly homeless individuals who are also disabled. Satellite Affordable Housing Associates and St. Mary’s Center are partnering to offer a robust supportive services program that includes a variety of community building activities, case management, and continuing education classes to all residents free of charge, empowering them to age in place and live independently for as long as possible. Thoughtfully designed by David Baker Architects, the five story LEED Platinum community includes two community kitchens, indoor and outdoor dining areas, a wellness room, a community garden, a computer lab, a large community room that connects to a landscaped outdoor community space, and a penthouse multi-purpose room with sweeping vistas of Lake Merritt and the Oakland skyline. These ample and well-appointed common areas, combined with the comprehensive services program, will enrich residents’ lives with numerous opportunities for social interaction and community involvement. Lakeside Senior Apartments numerous green building measures and sustainable design feature helped the project earn an impressive Platinum rating from the USGBC LEED for Homes rating system. As an infill development, Lakeside is ideally located adjacent to Lake Merritt and within walking distance to many neighborhood amenities, including grocery stores, restaurants, bakeries, parks, and numerous public transportation options. Since many of the seniors who reside at Lakeside do not have access to personal vehicles, the ability to easily access everyday amenities is critical to their success in living independently as they continue to age. The ground-floor courtyard, which makes up less than 10% of the site area to increase density and reduce irrigation needs, is a prominent feature of the project, designed as a "parterre” garden – a richly planted patchwork of native and drought-tolerant plants meant to be viewed from above. The courtyard connects seamlessly into private patios and a large community room. The courtyard planters and permeable paving at both the courtyard and roof decks manage storm water runoff. Additionally, residents’ plant and care for raised vegetable beds at the 5th floor roof deck while enjoying breathtaking views of Lake Merritt. 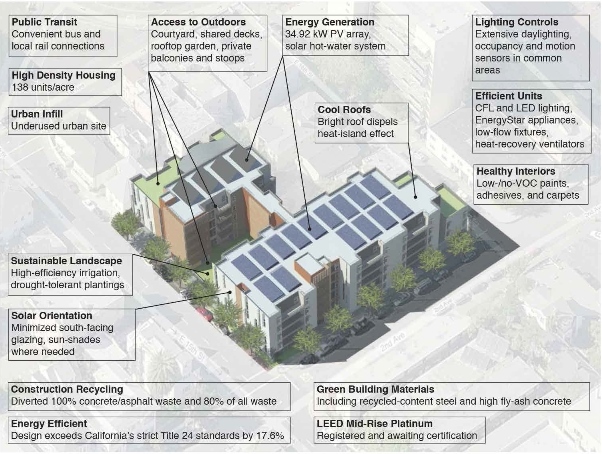 The building exceeds California's strict energy code by 22.6%, thus providing comfortable homes with low cost energy bills, essential for our low-income tenants. The massing on the south is arranged around shared balconies, which provide built-in shading while maintaining ample glazing area for daylight. On the west side, glazing is minimized and shaded to control any exposure to the seasonal heat spikes that occasionally take Oakland by surprise. A 35 kilowatt solar photovoltaic (PV) array produces electricity from the sun to meet most of the electric demand of the common spaces, elevator and outdoor lighting. Exterior lights were strategically designed with low energy fixtures to reduce light pollution and energy use. A solar thermal system also contributes 50% of the hot water needs of the building. Heat-recovery ventilation units were specified in each apartment to take full advantage of enhanced ventilation rates. While continuous filtered ventilation boosts indoor air quality, the heat recovery reduces residents’ dependence on heating systems by tempering the incoming air during winter. Fluorescent and LED light fixtures in each unit along with extensive daylighting, and occupancy and motion sensors in common areas were employed to minimize electric lighting loads. Finally, a high-quality and well-insulated envelope increases resident comfort and minimize drafts and heat loss. As long term owner and operator, SAHA is always concerned with a materials durability and ease of maintenance. At Lakeside, we used fiber-cement siding as the primary exterior finish as it is very resistant to rot with the added bonus of being cost-efficient. In the kitchens, quarz agglomerate countertops were selected for their high durability and beauty, and more than 80% of cabinet casework was sourced from FSC-certified wood. We installed high efficiency toilets, showerheads, faucets and laundry equipment in efforts to reduce potable water needs by 40% compared to a typical new building. Improving indoor air quality in the home is an increasing important goal as the rates of respiratory illnesses like asthma are on the rise. Our enhanced continuous ventilation system, along with safe contaminant control during and after construction was the principal priority for ensuring indoor comfort and optimal air quality. To further reduce exposure to airborne irritants, we chose paints, adhesives and carpets with low or no volatile organic compounds (VOC’s) and/or no formaldehyde.